It’s the end of the year and soon there will be all kinds of awards being given out for the best this and most valuable that, etc etc. In that spirit I want to nominate AP Lift 430 as Product of the Year for the polyurethane industry. Why a 3 Pound Density Foam? We didn’t randomly make a decision to manufacture a 3 lb density slab lifting foam. This was a calculated decision based on what we were hearing from contractors in the field and what we were able to do in the lab. Early in the history of Alchemy Polymers (one of the predecessors to Alchemy-Spetec), we manufactured only heavier density lifting foams to go along with our lines of leak sealing and soil stabilization resins. The reason being that our focus was on the commercial, industrial, and transportation segments of the market. As we became more aware of the potential in the residential market, we decided to make a superior lifting foam for that sector as well. Feedback from contractors using 2 lb and 2.5 lb density lifting foams seemed to indicate that they experienced too many callbacks - lifting jobs that resettled. We also found out that some contractors were using foams that were not designed to work in wet conditions. If they wanted something to work when it was wet; they had to pay a premium. Contractors were also told that these lighter density foams would increase in density as they pumped more under the slab, and that is true. But it also means having to put a lot more material under the slab to ultimately get it to a density strong enough for the job. From this information we developed AP Lift 430. Working with our chemist, we were able to create a 3 lb density foam that had higher lifting pressures than even our 4.75 lb workhorse, AP Lift 475. Clearly, this is not a product for snowflakes or wimps. We also designed it to meet DOT specifications: Hydrophobic (displaces water and works in wet environments), 90% Strength in 15 Minutes, traffic ready in 45 minutes, and NO shrinkage. One other thing… we don’t cut corners or put recycled materials in products to save cost. Our green statement is that you only have to do the job once. In 2017, AP Lift 430 really shined for us. 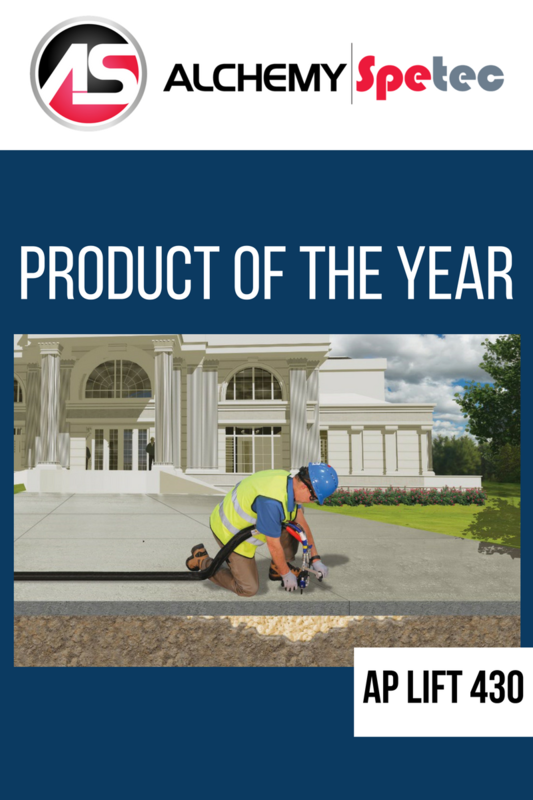 Easily our number one product for residential slab lifting, its combination of excellent expansion rate for filling voids and high lifting power has made it the go to product for contractors. Once you try it; you won’t go back. It literally gets more done with less material required. And now...AP Lift 430 is officially NSF / ANSI 61 approved. This means it is approved for contact with drinking water and that it is also the SAFEST slab lifting polyurethane to have installed around your family and pets. Ask your current supplier if their product is NSF approved and I think you’ll find that it’s not. Tired of callbacks? Tired of foams that shrink and fail in wet environments? Tired of foams made by insulation experts rather than geotechnical experts? Make the move to something safer and more powerful - AP Lift 430 and the rest of our Lift series foams. Want more information on Alchemy-Spetec slab lifting products?